I found an article today discussing the top 20 most destructive dogs. They are not talking about dogs attacking people or other dogs but simply destruction of property around the house and in some cases, the house itself. The study was done by a British insurance company. A total of 3,000 dog owners were interviewed by Esure Pet Insurance, which found nearly two-thirds had paid to repair or replace items damaged by their animals. Most of the breakages happened when the dogs were puppies. 14 per cent of owners said they had put up with doggie destruction throughout their dog’s life. Before we go on there are two things I need to mention: 1) CarryMyDog.com specializes in products to manage canine separation anxiety, noise phobia and other types of canine anxiety. We have dog crates, the same dog crates needed in puppy training and for containment of dogs small and large to prevent property damage. If you have an adult dog still destroying property you need a heavy duty dog crate for containment when you are away from the house. Canine Separation Anxiety is a major problem in so many households. 2) Property damage costs are shown in US Dollars simply because I couldn’t find the British Pound symbol on my keyboard so the amount is actually higher because of currency exchange rates. The most common form of damage is stained or soiled carpets, scratched doors, chewed door frames and ruined clothes. Ripped sofas, chewed wires and broken ornaments are also common. The number one dog was not so surprising but, the dog breed in the number two spot was. 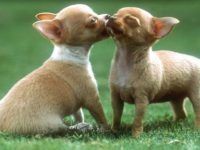 The #2 most destructive dog is the Chihuahua. It is surprising that such a small breed can crate so much property damage. This is my opinion only but with each and every destructive mention above you will find boredom and/or canine separation anxiety. Where separation anxiety is present you need to manage the problem by containing the dog while you are away from the home. For small dogs that’s a wire dog crate. For stronger adult dogs that means a heavy duty dog crate. While using the crate, get a seasoned dog trainer or dog whisperer to work with your dog. The problem will not go away without some attentive training. I almost forgot to mention that I also have the absolute best pet urine smell and stain remover on the planet. When you read about it you will understand why. No hype just the facts. To help minimize your dog’s destructive behavior, house-train them from a very early age, maintain their health with regular vet check-ups and give them plenty of exercise – a bored dog is often a destructive dog. I hope you found the Top 20 Most Destructive Dogs interesting and informative. I found it interesting and a bit scary. Some of the most popular breeds are on that list. Nice Posts. I have bookmarked your site. There are two things that top my list of why dogs destroy property or escape from yards. The first is the lack of companionship and the absence of a pack leader. When new puppies or dogs first come home to a new family they need lots of attention and socialization. Leaving them alone in the house, yard, or crate causes stress and creates insecurity. Dogs were not meant to live alone. Boredom is a sub-topic of number one as well as number two on my list: lack of exercise. As the article and Angie report, lack of exercise is the root of most mischief in dogs, children, and horses. Pets and children are responsibilities that offer amazing blessing but require great commitment – every day. Very good post Bill. Not enough exercise and boredom I would have to agree is one of the leading causes of dogs becoming destructive around the house. That is not only true with humans but our pets also.